Mauro Caminati, Technical Innovations, Life of Equipment and Effective Demand. 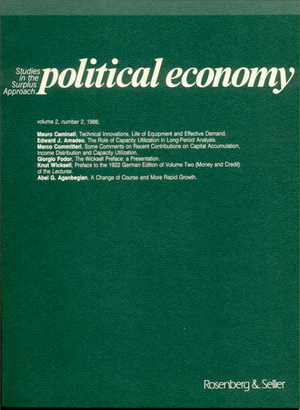 Edward J. Amadeo, The Role of Capacity Utilization in Long-Period Analysis. Marco Committeri, Some Comments on Recent Contributions on Capital Accumulation, Income Distribution and Capacity Utilization. Giorgio Fodor, The Wicksell Preface: a Presentation. Knut Wicksell, Preface to the 1922 German Edition of Volume Two (Money and Credit) of the Lectures. Abel J. Aganbegian, A Change of Course and More Rapid Growth.